Access to scholarly publications in the 21st century has been greatly enhanced with the emergence of open access initiatives the world over. This new trend has contributed immensely to the development of a global scholarly communication system. 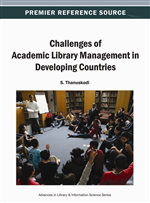 This chapter investigates various facets of the Open Access (OA) movement and its growth in Africa. It highlights different roles played by organizations, libraries, publishers, and researchers in the development of OA. Furthermore, the chapter discusses the benefits and challenges of OA to various stakeholders. It concludes with recommendations on how to improve open access in Africa. The revolution of Open Access since early 1990s has liberated libraries and Information Centers all over the world. The era of open access is dawning and it could not come a moment later. Open Access to information is an innovative mode of scholarly communication within the digital environment aimed at achieving universal access to knowledge. Many attempts toward defining the concept of open access have been advanced by scholars, according to Zuccala et al. (2008) the term open access has been given a variety of definitions while its meaning is still evolving. Series of meetings have been organized by OA stakeholders at various locations to harmonize different forms of definitions. In 2002, Budapest Open Access Initiative defined OA as “free availability on the public Internet, permitting any users to read, download, copy, distribute, print, search, or link to the full texts of these articles, crawl them for indexing, pass them as data to software, or use them for any other lawful purpose, without financial, legal, or technical barriers other than those inseparable from gaining access to the Internet itself”.